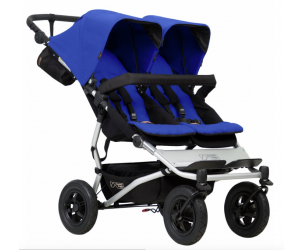 We recently go at this mountain buggy duet in silver/grey for my toddler aged two and new born. The positives first: it’s a great little double, fits through all the doors extremely easily as it’s designed to be smaller than other doubles in its competition. Steers very easily and can lock the wheels if necessary, and the basket space is a dream. Plenty of pockets round the outside of it and even comes with a drinks holder too. The opportunities: firstly the hoods, I’ve found this with all the MB range but the hoods don’t come down far enough to actually block much sunlight out. The seats don’t sit up at full 90degree angle it’s always more slouched back and my toddler hates that. However they do recline to a good angle. The break is on the inside on the left and I feel it should be situated outer way instead like a bike break. Lastly, you have to buy EVERYTHING separately as it was hard to find the family pack in my colour choice. This includes the rain covers,adapters,carrycot etc. Love this for our twins who are now 17months old. Great everyday use when we are out and about. Very easy to push, small enough to fit through narrow doors. Very sturdy. Very amazing buggy especially with two children different ages. Very sturdy buggy when going for long walks in the countryside, and basket very good. The hood is good for keeping the sun out of the kids eyes and its extendable. Would highly recommend. I used this when I had my second and my first was only 21 months. For my piece of mind I need both kids in a pram. At that stage my oldest would run off and didn’t walk for very long. I loved this pram because it’s narrow and I could add a carrycot. It’s a real work horse pram I’ve had a 1 yr, 3 yr in the seat then a 4yrs sat on the plastic foot rest. Over review say the seats are narrow but I don’t think it’s that bad. I have a estate car so it fitted fine in my car but if you had a smaller car you may struggle. I absolutely love this buggy and it has been through 4 children! You can steer it with ease and fit through most spaces as it's a lot thinner then most double buggies. The seats fully recline for a newborn or a sleeping child and love that it has separate hoods. The under storage is massive too. Excellent buggy, I have a newborn and toddler. Fully recline for my newborn and my toddler can sit up separately without disturbing his sister. Advantage with two separate sun shades each child has their own. This buggy is easy to turn with one hand and is lovely to take a stroll with. Would highly recommend if you still have a toddler that can’t walk independently and gets tired easily. We needed a double buggy that was narrow enough for the thin village footpaths. This does the job well. Previous single buggy was a bugaboo. I prefer the easy steer of my mountain buggy & it’s also half the price of a double bugaboo. We absolutely love our duet v3! We use it for our twins and have two carrycot pluses which we used from birth. Our twins were early and loved the cosiness of the carrycots. People think they are narrow but actually it was perfect as they napped so well in them! We are using them in parent-facing mode at the moment (by converting the carrycot plus) and it is fab being able to see them whilst they can also look out and about. The best thing for us with this buggy is that we can get in and out of shops so easily. I just love being able to fit through a standard single door when people are thinking we won't get in! Also, the handling is just fantastic - I can push it one handed, meaning I can either hold my husband's hand or even hold a baby if needed! The only negatives are the difficulty in keeping the hoods up in carrycot mode (fine in parent-facing and world-facing modes) and also how heavy it is when putting it in the car. It hasn't put me off though - I love it! This is an amazing all round pram. I’ve used it for my 10 month old twins and new born and none twin and my three year old son have all had a trip in it. and the carrycots turn into parent facing seats. I have the mountain buggy duo for my 12 week old twin girls. 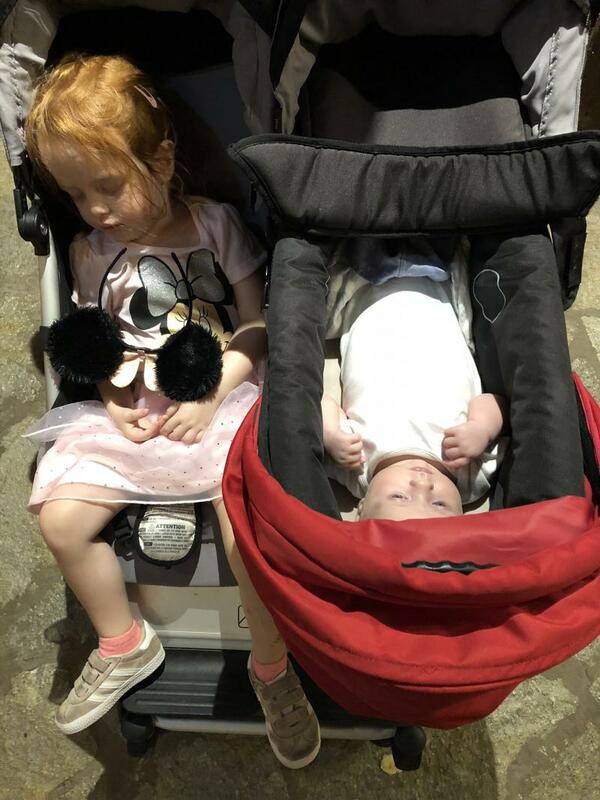 These are my first children so didn’t really know what to look for in a buggy, we tried the bugaboo donkey duo and found that hard to put down when I was on my own and took up a lot of boot space. We were recommended the mountain buggy by a friend who has had twins and decided to give it a go. I find the buggy so easy to push and steer and it fits down every isle in shops. It’s easy to fold down and store away although it does take up a bit of room in the boot it’s not as much as the bugaboo. The only down side to the mountain buggy is the basket underneath is hard to access if the seats aren’t sat up. Other than that it’s an amazing buggy. I love this pushchair, it is the best I’ve owned! Currently i’m using it with 3 year old and 3 month old, the 3 month old baby is in the carry cot attachment but soon to go into the next stage seat. The main two seats are comfortable and even large enough for my 6 year old to sit in during a trip to Disney the other week. A proper large family pushchair. This product is amazing, we use it for a 1 1/2 yo and 4 1/2 mo. It's cheaper than some similar designed buggies. As it's the same size as a standard wheel chair it fits through normal sized walk ways. Easy to assemble. Had this buggy to fit new born twins up to age of 3! It's extremely solid and of great quality buggy. The width wise, it's the smallest possible to fit through any door but it does leave enough room for kids. We had it with carry cots and then seats. Changing from carry cot to seats was a bit confusing but the instructions were clear, so if I only followed it at first it wouldn't be an issue at all. I loved how smooth the ride was and didn't have to worry about any curbs or uneven pavement. It definitely is all terrain buggy with a city look. It is light comparing to other brand I've tried before and definitely worth the money as it's more of a long term buggy. The basket is fine and the goods were also good, although they could be slightly longer. Saying that, I did have a different stroller with longer hoods and they just didn't appear too great, so it may be that these are doing the job and are presentable. The leg rests for the kids are fantastic once they reach them, otherwise I'd prefer if they could have a bit of seat extension to rest legs on something softer. Easy to wipe and keep clean. The handle adjustment was only to fold it but not to extend it, so may be tricky for taller or smaller people to push. The add ons like carry cots and car seat adapters etc are a bit pricey considering you may need two at the same time but the quality and sturdiness isn't questionable. This buggy is of a city look, build to last and definitely worth the price. My partner convinced me to get this buggy, its a good buy as you can use it on any terrain, which is great if you want to take the buggy to the beach or up mountains and its easy to steer. Only down fall really is that i couldnt find one other than grey or black and have girls so some brighter colour choice would of be great and you need a fairly large boot to fit it in your car, it fits in my other half bmw easte and my step father truck but if there not around i cant got far with the buggy as it doesn't fit in anyone else car. Mountain buggy diet in general is great for every day use. Although it seems bulky it actually surprises people when I’m able to get on buses and go through doors with ease. Love that the handle moves up and down too. Downside to this buggy are easily recified... straps need to be extended as they are far too tight even for my 1 year old! The tires are my major issue... they need to be soild as they deflate really quickly and are not easy to inflate when you’re on your own.y only other real issue is the size of the seats (just a little bit wider would be good!) and the sunshade needs to come over a little more! Other than that I really do love my mountain buggy Duet! Fits through all doors, on buses and great to steer. The sunhoods are canvas so get dirty easily and are short so do not protect from sun. I spent a lot of time looking at all different types of buggies and strollers for when my daughter was born 14months after my son. I needed a buggy that was suitable for all terrain, comfy for both my children, fits through doors and on buses and this really is the only one that met all those. It is also so easy to move around and has a large basket for storing all your essentials and more. 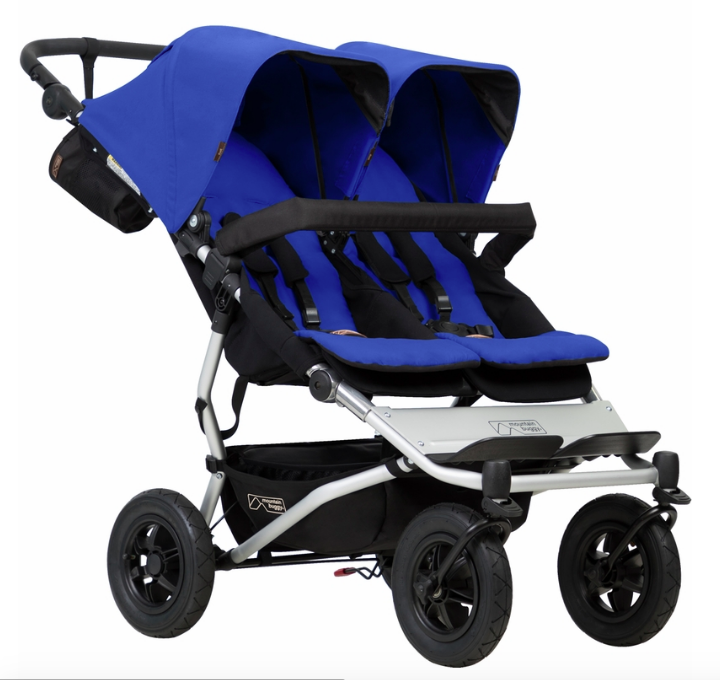 There's more than enough room for two in the Mountain Buggy Duet 3 Double Buggy! This compact, all-terrain side-by-side double buggy is the same width as a single buggy and is ideal for twins or siblings. Both full-sized seat boasts a fully-flat reclining mechanism, padded harnesses and an all-round bumper bar. With a one hand stand fold and an automatic frame lock, this double pushchair can be folded away quickly to fit into your car boot when you're on the move.